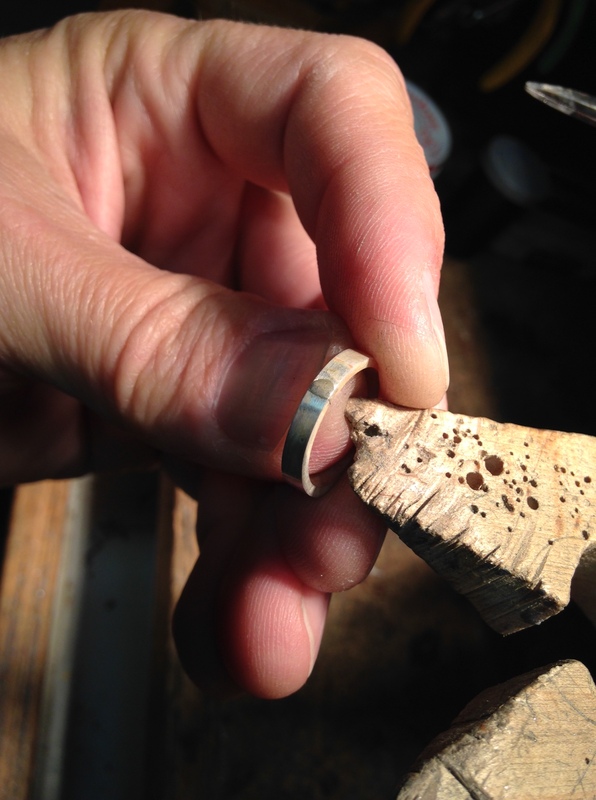 Today we will look at a few tips on soldering and for the example, I will size a silver ring. First, figure out what size the ring is, and what size you need it to be. For each size difference is approx 2.4mm. 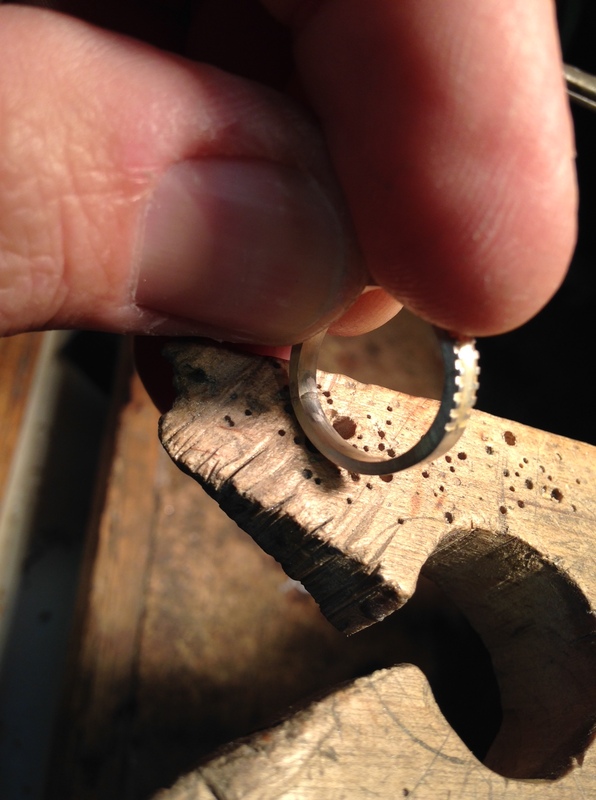 In this example, I will size a ring down, so I marked the ring and cut the ring using a 3/0 saw blade and supporting the ring with a ring jig. I cut just inside the marks I made to allow room for filing. 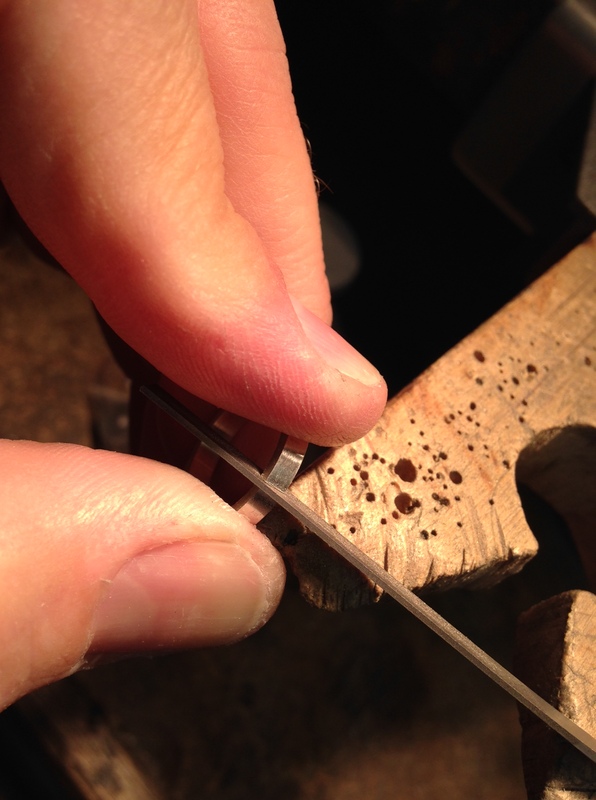 I use an Equalling Escapement File to file the inside of the shank, what this file does is makes sure the two ends are parallel to one another so there are no gaps in the soldering process. Gaps usually means pits in your solder joint. 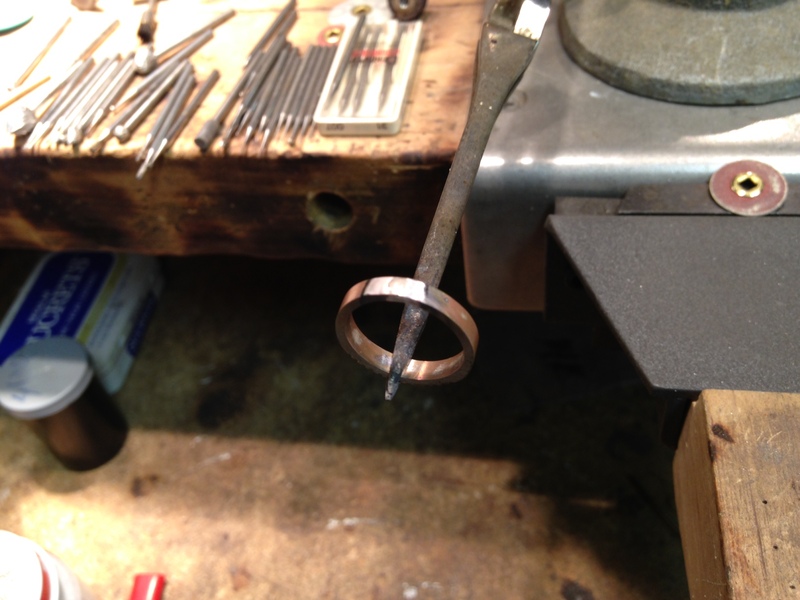 Next, I make sure the two ends are touching with no gaps, if the top of the ring is strong enough, I will twist the shank a bit and bend the ring past center, to compensate for the “spring” in the metal. You want to make sure the two ends match very close. Now, clean the solder joint very well, if you have an ultrasonic cleaner and a steamer, that would do the job well, but if not, soap, water, and a soft tooth brush will work. 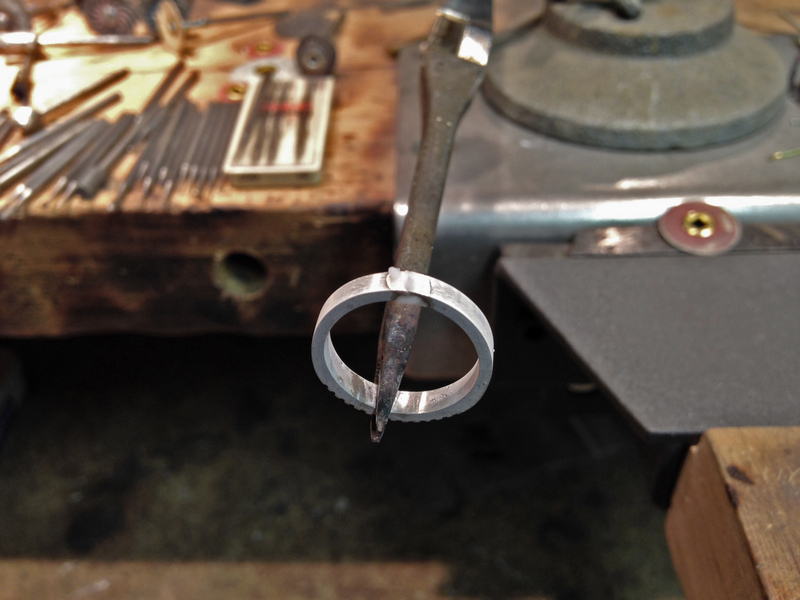 Protect the ring’s finish by dipping and “swirling” the ring in a mixture of Denatured Alcohol and Powdered Boric Acid . I always keep this mixture around and dip everything in it before soldering. I keep it mixed, about 1-2 tablespoons of boric acid to 1 oz. of alcohol. I keep it in an old baby food jar. works great on both gold and silver. Let air dry before soldering, you will notice it will turn your jewelry “white”, this is good, it is a thin coating of protective boric acid which will help keep fire scale down. Next, I add flux and solder. 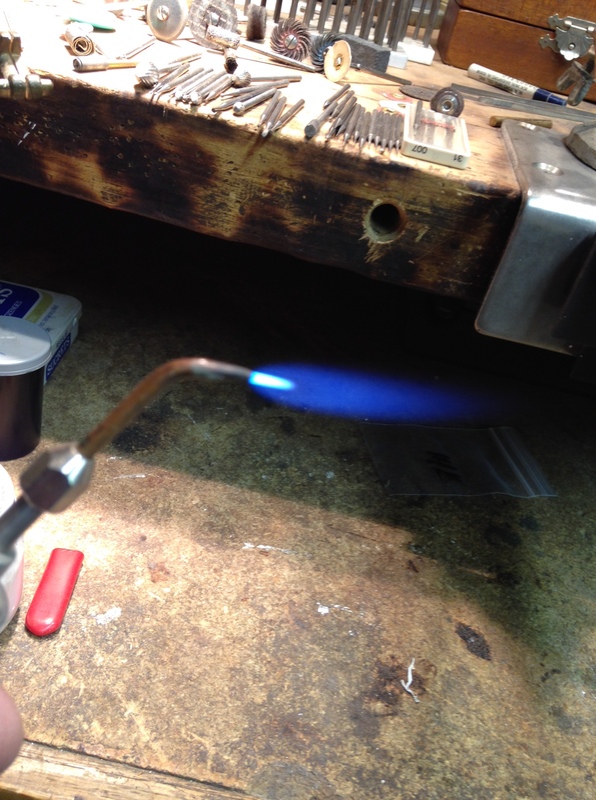 I use Handy Flux , a brazing flux that works great, especially on silver, but I use it on gold as well. I also keep this in a baby food jar, along with a silver wire to apply the flux. Coat the solder joint well. Heat the piece until the flux just stops “bubbling”, then add a small piece of solder with a soldering pick. 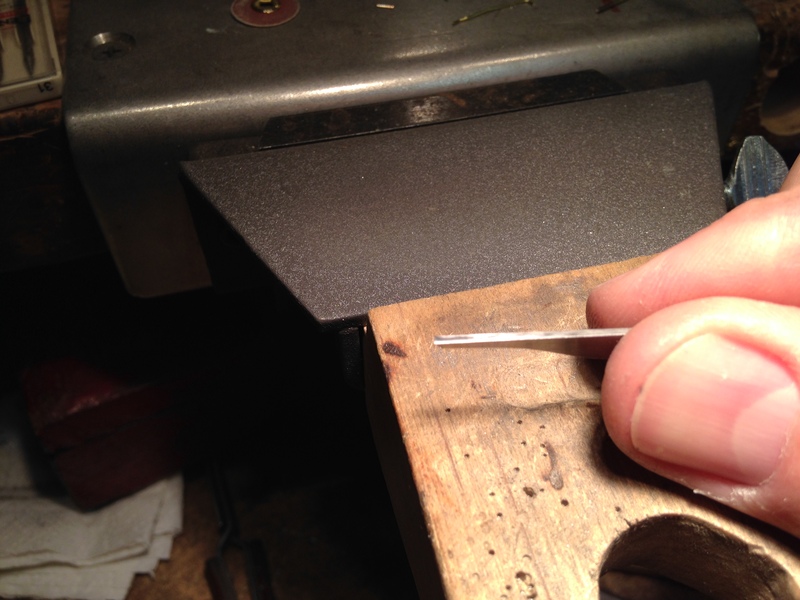 I use a TITANIUM SOLDER PICK , the solder doesn’t melt to the titanium like it will to steel. I just barely dip the tip into the jar of flux and pick up the piece of solder with the pick, then apply it to the top of the solder joint. I used medium SILVER SHEET SOLDER and I cut it as needed. You will be tempted to want to use a bunch, but you don’t need a lot. See how much I used for this application. Now comes the FIRE!! I use a Smith Mini Torch and have used one for years. The gas I use is propane and oxygen, but you can use Acetylene or Natural Gas. I like the propane because it is easy to get, and it is a much cleaner gas to use. Acetylene produces black smoke and “floaties”. 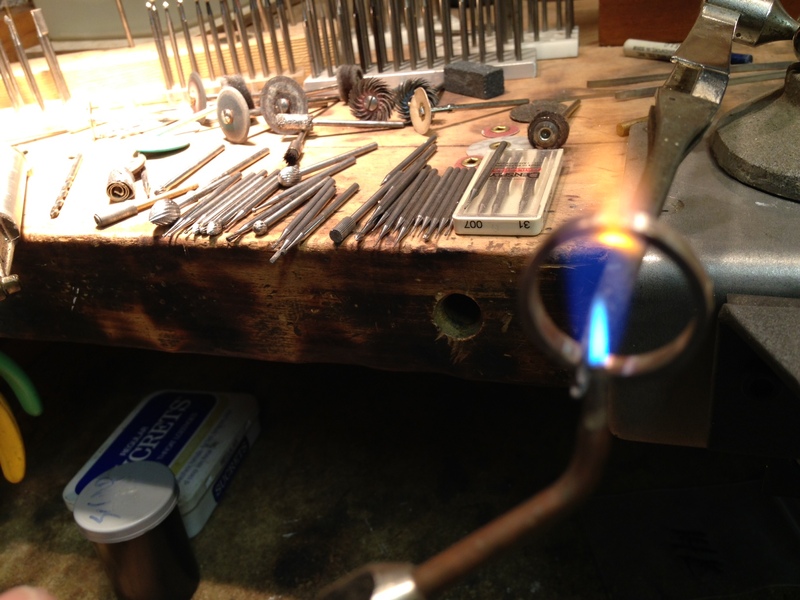 I use the #5 tip that comes with the torch, in fact I drill it out a bit to give me more heat on larger projects. I use the same regulator on the propane that I used to use on acetylene. You will want to get a flame that is not too “bushy” and not too “sharp and pointy”. The flame in the image is what you want to aim for. I mentioned that you wanted to apply the solder to the top, this is because we will be applying the heat to the bottom of the solder joint. 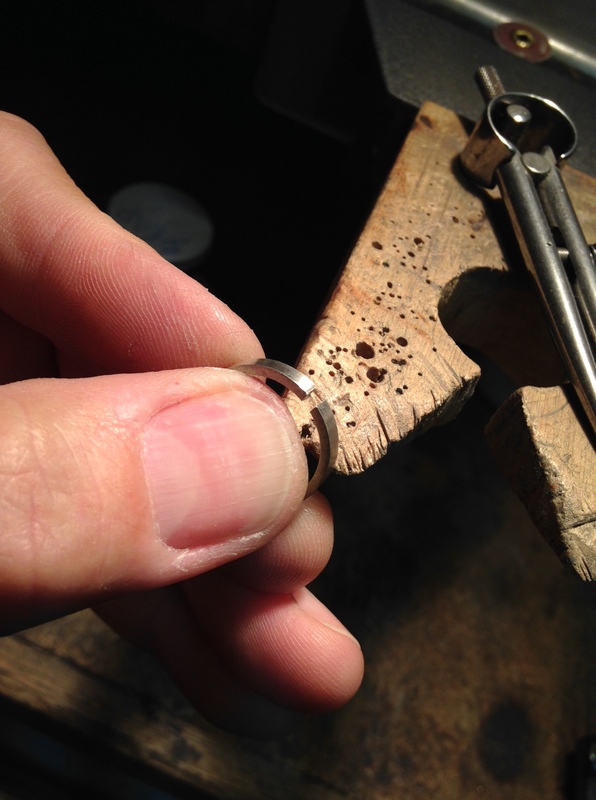 One of the biggest mistakes many jewelers make is applying the heat to the solder, this is a NO-NO. You always want to apply the torch heat to the opposite side of the solder joint because solder is drawn to heat, like a moth to a flame. 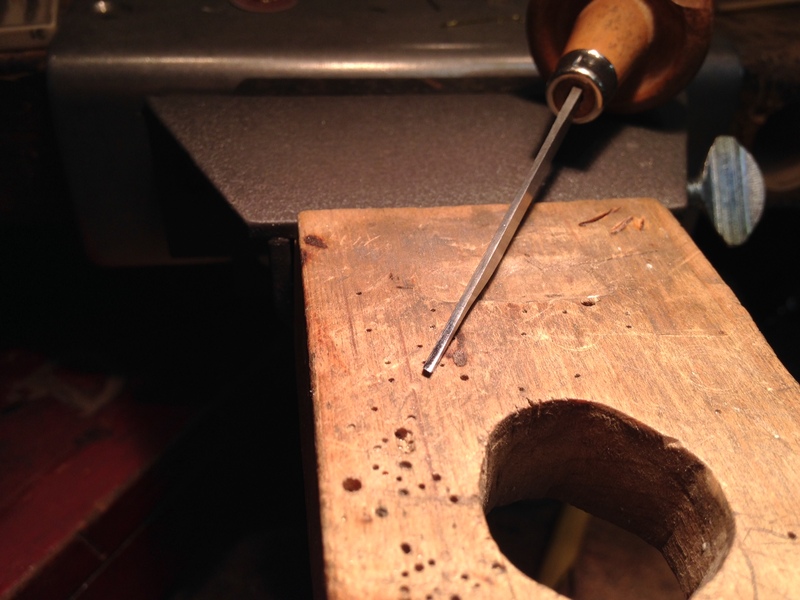 When you do this, you “draw” the solder THROUGH the solder joint, making a stronger joint with less pits. Also if you melt the solder first, you “boil” the solder, changing the characteristics of the alloys in the solder, making it flow less and more brittle. After soldering, place piece in a pickling solution. I use Sparex which will help remove fire scale as well. I use a very small CERAMIC LINED CROCK POT to heat the pickling solution. Heating the solution makes it work a lot quicker. We will get a lot deeper into soldering in the future, I hope this helps. Welcome back to day 3. 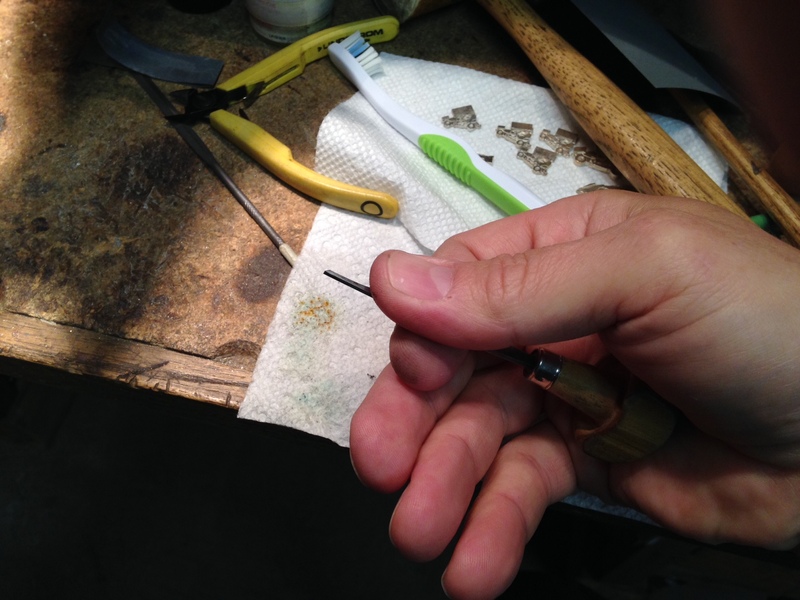 I had a couple of questions/comments about the graver that I used to shape the earring I made yesterday, so let’s jump into tools and tool maintenance, namely… the graver. 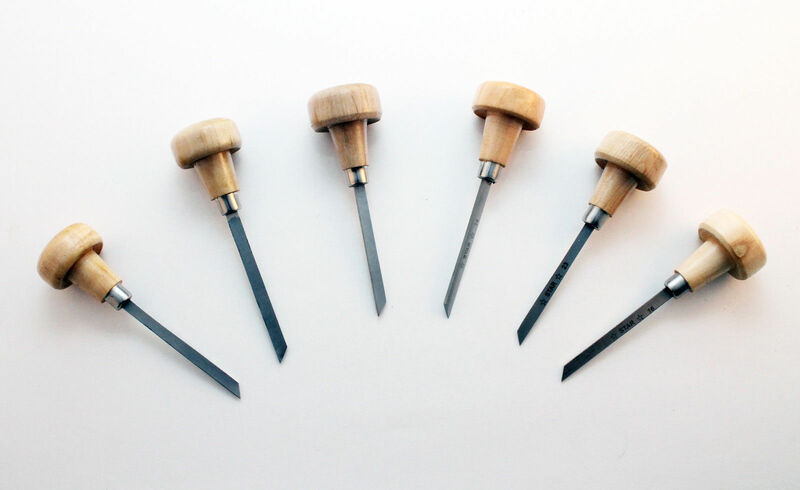 There are many shapes and sizes of gravers available, but if you want to get into hand crafting of metal, get familiar with a few gravers. I will just touch on one today, but at a later date, we will get into a few more styles. 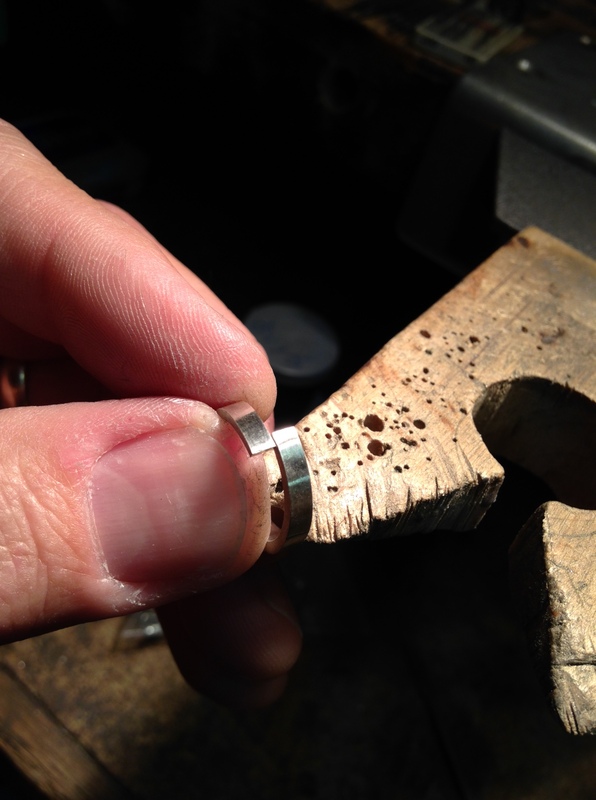 When it comes to metal clean up, getting into those tough to get areas, or just getting a flat clean edge on a piece of silver or gold, my go-to graver is a flat graver. 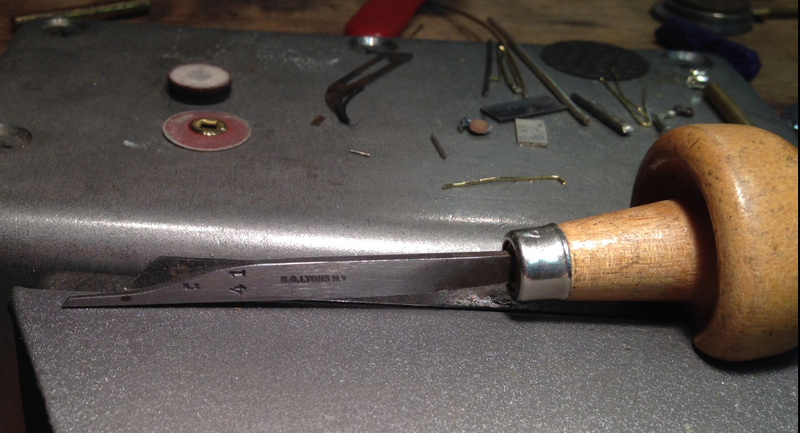 Get yourself a few of these in different widths and see what you can do, it will become a tool that you will grow to love, but when it comes to shaping a graver, there are a few very important things you must do first. 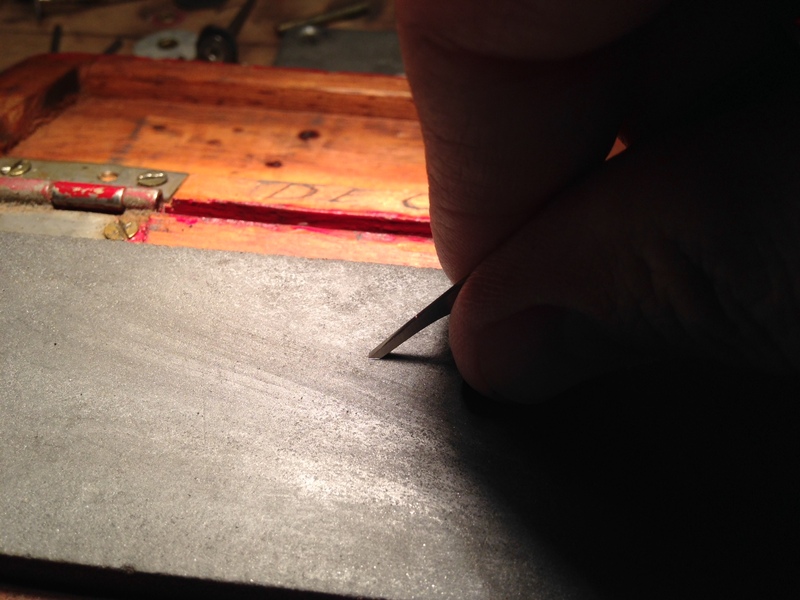 When you buy a new graver, it will have to be shaped and sharpened. This shaping process is VERY important and you must be VERY PATIENT! I cannot express this enough. 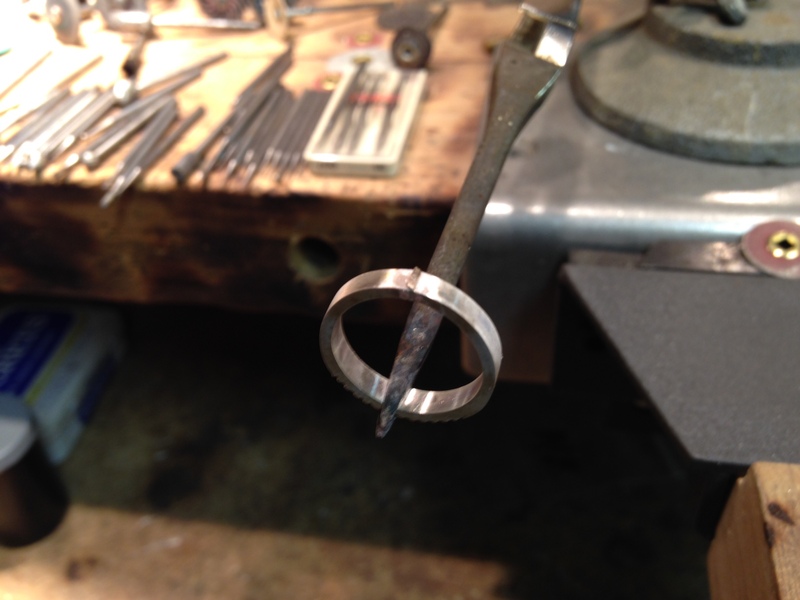 The hardness of a graver end is heat treated and it is very easy to change it, do to overheating by grinding. First, get a graver handle. These come in different lengths as well. 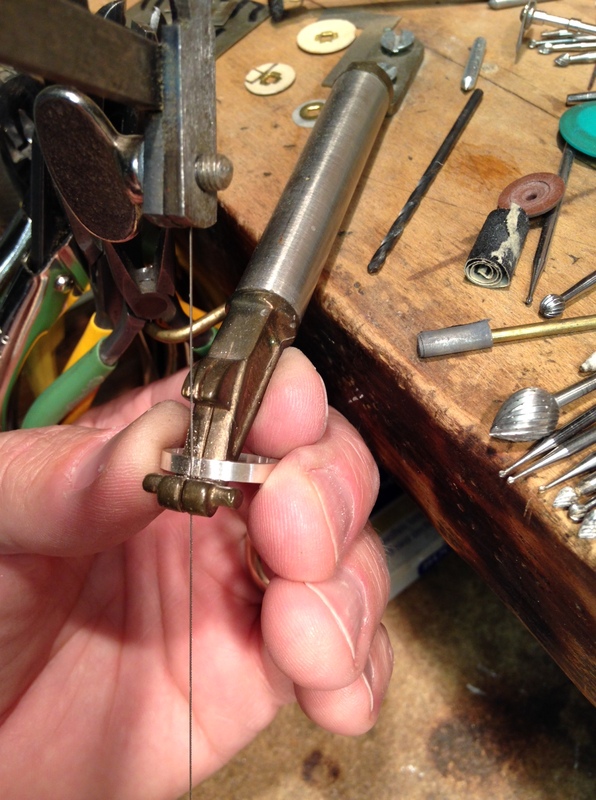 Find the shortest handle first and mount the pointed end of the graver into it. Your graver will last years and years, and if it gets shorter, then replace the handle with a longer handle to lengthen the blade. I find it easier if you drill a hole into the wood first, (approx 1/8″ drill bit). There are a few shapes of handles as well, I like the ones that are mushroom shaped with a flat spot cut into it. It fits better in my hand. 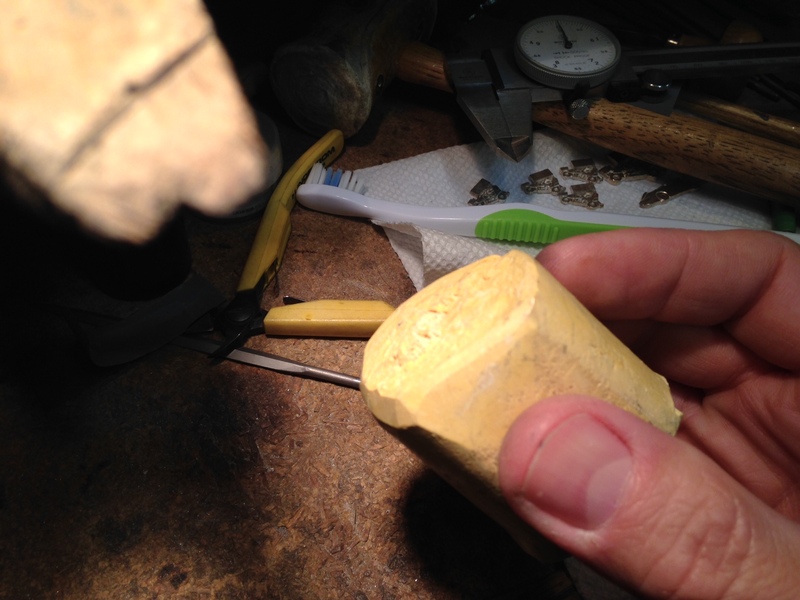 After you have drilled the hole into the handle, about 1″ deep or so, pound the graver blade into the handle. 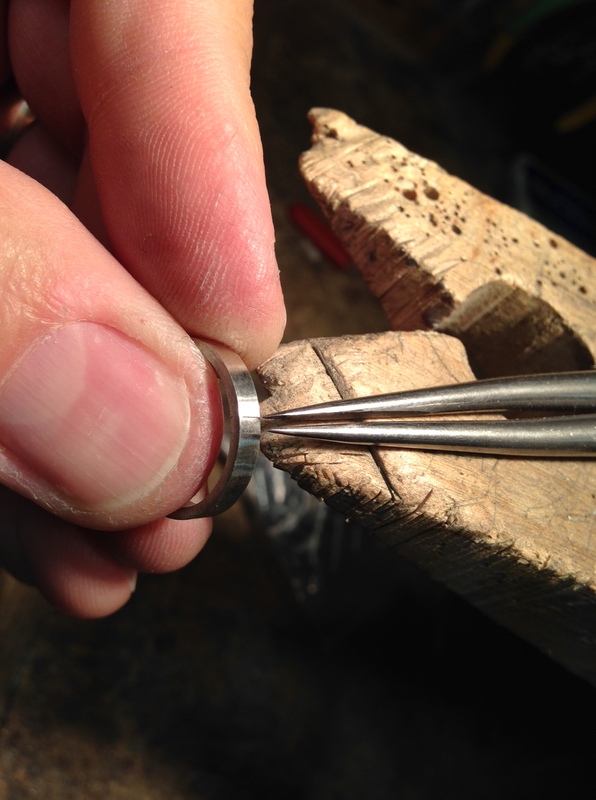 I find it easiest to place the graver on a piece of wood, like a small 2×4 or something like that, then I pound the handle onto the graver, making sure the bottom edge of the graver is lined up with the flat edge of the handle. After the graver is seated firmly into the handle, place the graver in the palm of your hand so that it sits comfortably. Hold it comfortably so that the graver handle rests in the palm and the graver blade is held in the thumb and forefinger. 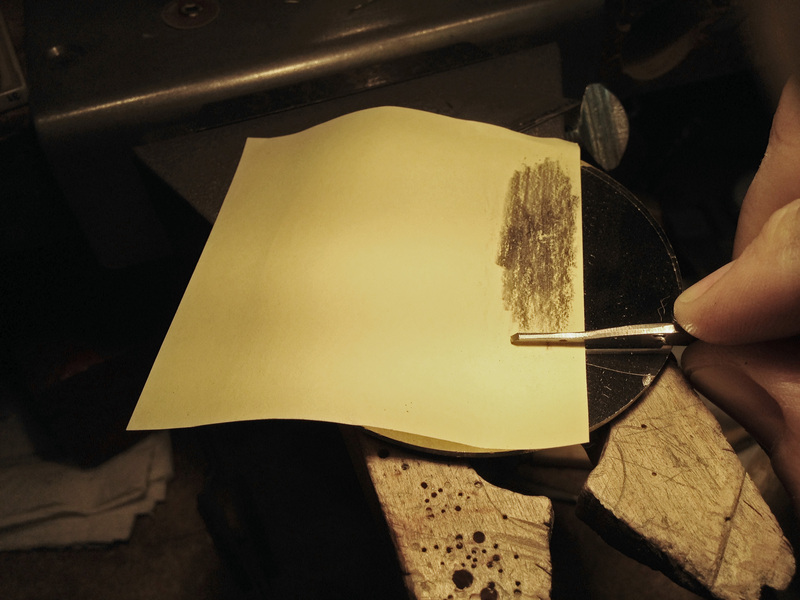 make a mark on the blade about 1/2 inch past your thumb. This is where you will cut off the blade. (they come longer than needed). I use a cutoff wheel to trim the excess off. After it is cut off, the shaping begins. Again, I cannot express how important it is to take your time doing this. Have a cup of water handy and grind the graver for about 1 second, then dip it in the water, grind for 1 second, then dip in the water……repeat, repeat, repeat. You do not want this graver to get hot or it will not work properly, it will chip and break easily or get dull quick. Some people like to grind the opposite edge at about a 5-10 degree angle (called a heel) which helps the metal to be removed easier, I just keep mine flat. Another trick I like to do is to polish the bottom side of my gravers, which leaves a “mirror” finish. I do this by first removing all the scratches on the bottom side of the blade with 600-1000 grit sandpaper, then taking hard yellow polishing compound and rubbing it on a piece of paper, coating the paper with the compound, then rubbing the bottom side of the graver on the paper, polishing it until it is shiny and scratch free. 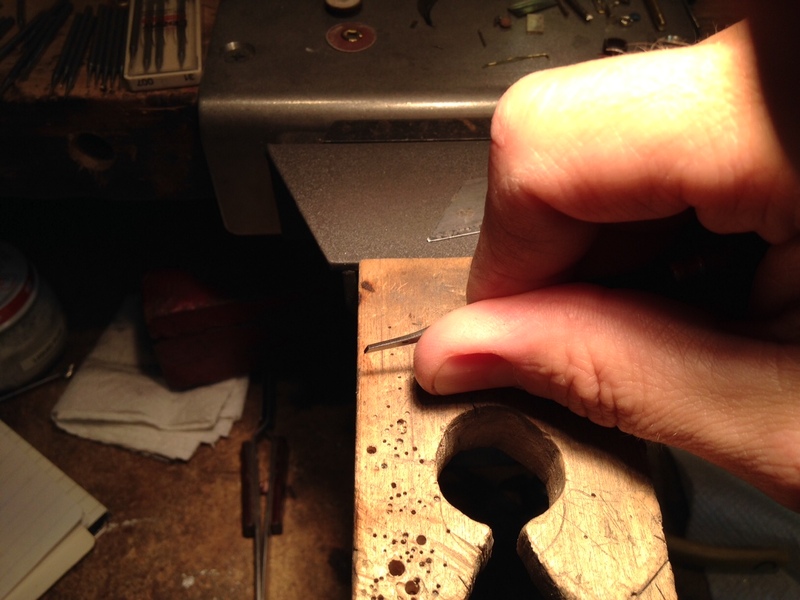 This will make your graver cut silver like butter and give you a super-shiny surface. I hope this was not too confusing…… if it was, feel free to comment and ask questions, I will try to clarify if need be. I guess the first subject to talk about at this point is starting a design. The great thing about designing jewelry is that you have a blank page, if you are making jewelry for yourself, there is no right or wrong design, it is an expression of yourself, and the only limitations are your skills, and that is what we are here to do, hone our skills. If you are making jewelry for others or for the market, then you have to take their likes and desires into consideration. 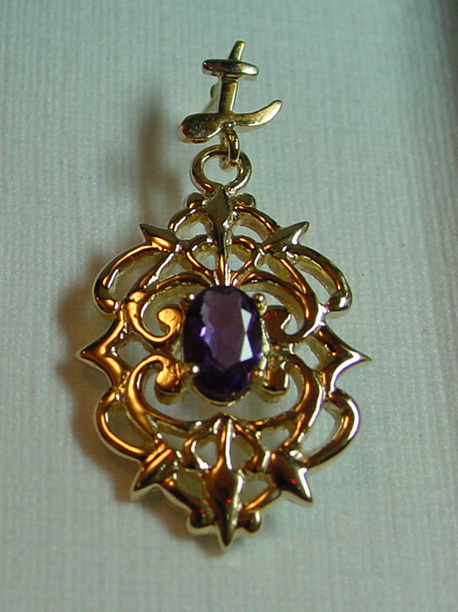 There are a number of ways to start to create jewelry, from finding an existing media and turning it into jewelry, to Computer Aided Design (CAD), wax carving, metal fabrication, Precious Metal Clays (PMC), etc. We will touch on all of these things in the future. 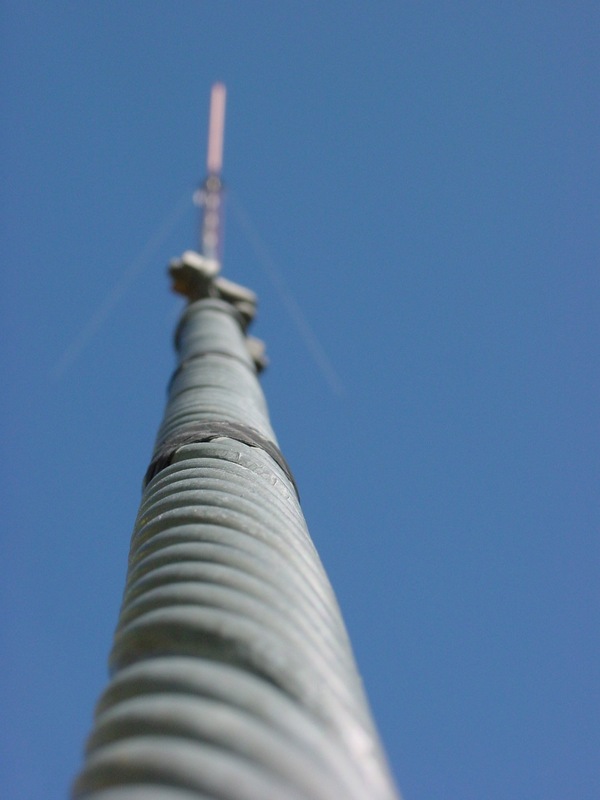 For the first step let’s look at metal fabrication. 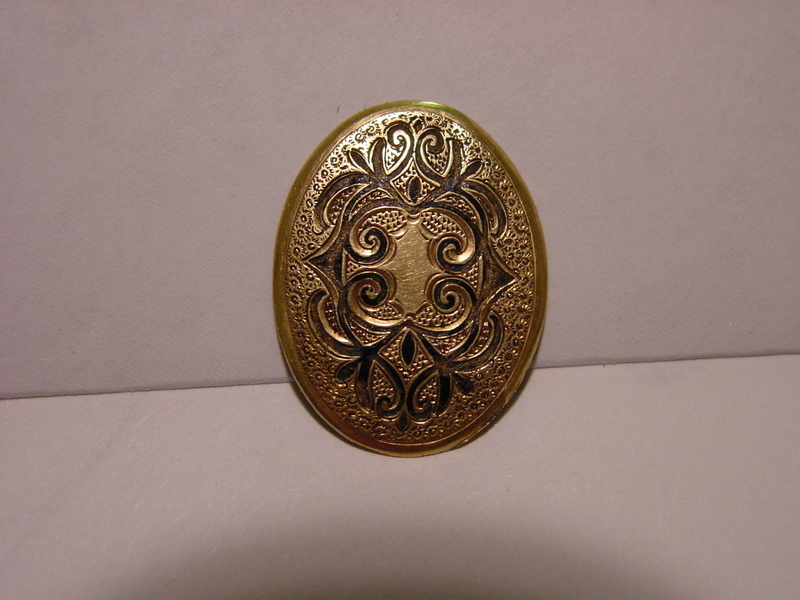 I found a design on an antique locket that I would like as an earring. If I could draw, I would but alas, I can’t draw my way out of a paper bag. I found a way to scan the design and get it on a piece of paper. 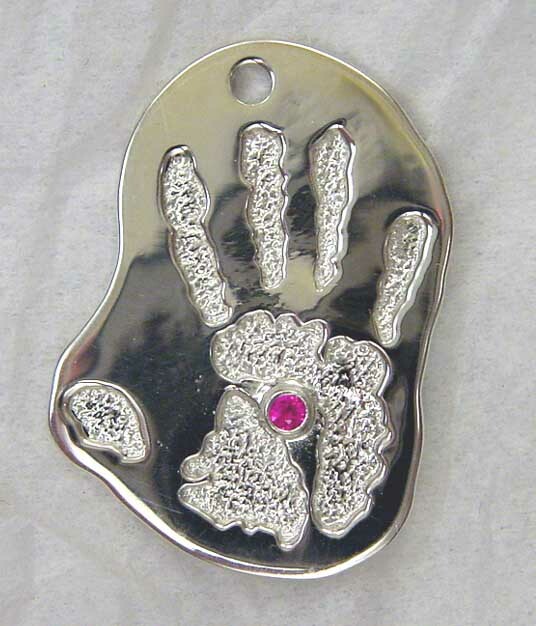 In this instance I used a CAD program, but you can use the original picture, scaled to the size you want, and then I cut and taped it to a flat sheet of sterling silver. I took a very sharp metal scribe and traced around the outside of the picture with a series of small points, just hard enough to make a mark, but not too deep. 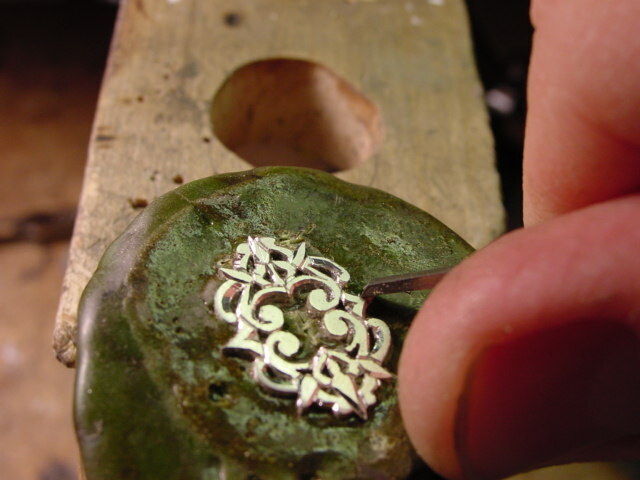 After I traced around the design completely, I removed the paper and I have an outline on the silver. 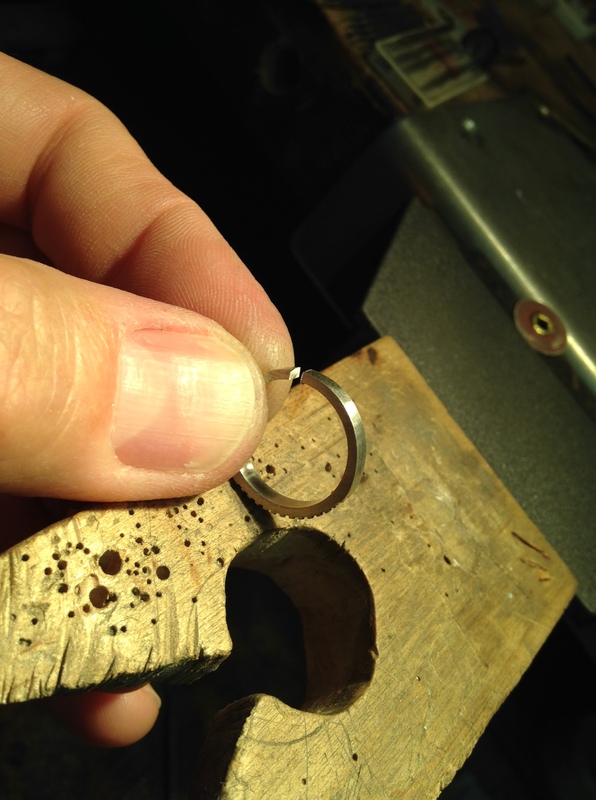 (this works on wax as well) I now pierced the silver with a hole large enough to get a saw blade through. I usually use a 3/0 blade, but you can use smaller if you like, I tend to break smaller ones a lot more. 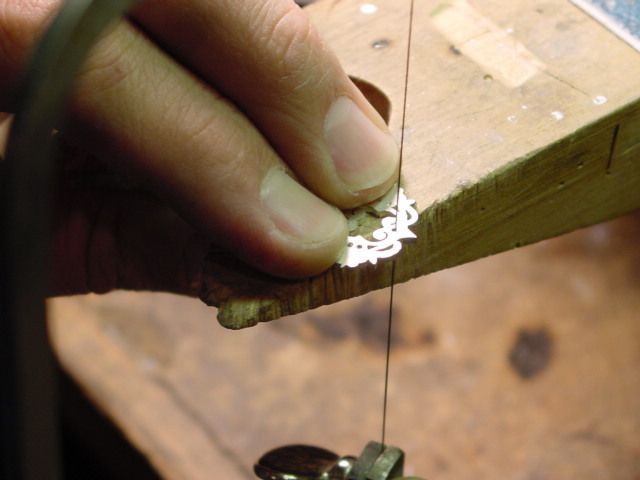 after I have the piece completely cut out, I smooth the edges with small “escapement” files and sandpaper, then polish. At a later date we will get into detail on how to best file, sand, and finish pieces, but I figured we would start with an easy way to get your ideas onto metal or wax. On this piece, I also used gravers and a foredom to give the piece more of a rounded look, but that is what I wanted and that is the cool thing about jewelry making, it is an expression of one’s self as well as a craft. Thanks for stopping by, I will keep these posts short and to the point in the future, I know we all have busy lives and I would like to give quick tips as opposed to long lessons. Are you ready for a journey? I am, so lets go……. Howdy and Welcome to JewelryMonk! Something new is coming. I am embarking on a journey, something completely new to me, and truthfully something I am kind of uncomfortable with, but am willing to jump in and see what the “water” is like. I will be sharing tips, tricks, and methods I have learned over the 28+ years I have been in the jewelry industry. I know I can’t take it with me, and am a advocate of passing knowledge down, and being a good steward of the things I have been given. In the future, we will be adding a podcast (internet radio show), e-books, and whatever we can to help you become a more well-rounded jewelry maker. Are you ready? Come along this journey with me!